Cathedral's first double album splits the extremes of their sound onto each disc. The contrast shows listeners exactly what makes the band so unique. Cathedral is an excellent example of how to properly combine stoner rock and doom metal to create one intense musical experience. These English veterans have a much wider range of influences than just these two genres, though. Bringing together elements of Corrosion of Conformity, the Beatles, Primus, Soundgarden, and Type O Negative, Cathedral has an inimitable sound that is exclusively theirs. With eight classic albums under their belt and the support of Nuclear Blast Records behind them, Cathedral has become more and more ambitious in recent years. Their latest effort, The Guessing Game, is the pinnacle of this experimentation. This 13-song double album is where Cathedral shows their fans exactly what goes into their sound and how they achieve their uniqueness. 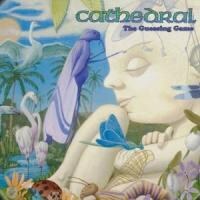 The first disc of The Guessing Game is oriented towards the rock elements of Cathedral's sound. With this half of the album, Cathedral appears to be paying homage to the important bands that started the UK rock and metal scenes in the '60s and '70s. Listeners will detect the soft ambiance of the Moody Blues, the progressive genius of Pink Floyd, and the straightforward intensity of Judas Priest. The songs branch out and change tone seamlessly, mostly alternating between progressive, grunge-infused sections and Southern-influenced hard rock. There's also plenty of influence from the psychedelic rock of the '70s, with long guitar parts and prominent keyboard sections. Most of the songs are slow, with only "Cats, Incense, Candles & Wine" maintaining an upbeat tone for most of the song. The two instrumental songs, "Immaculate Misconception" and "The Guessing Game", accentuate the tracks surrounding them. The second disc concentrates more on the metal influences within the band's sound, providing a nice contrast to the first disc's lighter approach. Instrumental opener "One Dimensional People" sets the tone immediately, with down-tuned guitars and greater emphasis on the bass. Lee Dorrian's vocal delivery is intensified and adjusted for the heavier feel of these songs, reminiscent of the sound and distortion used by High on Fire and Paradise Lost. Unlike traditional doom metal, though, Cathedral opts to maintain a faster tempo on most of these songs, relying on the guitar and vocal distortions to convey the appropriate atmosphere. That approach is what has set them apart from other doom metal bands for many years now, and it works for the band. Songs that follow this model, like "The Casket Chasers" and "La Noche del Buque Maldito", are some of the most memorable on the album, due to that divergence from the classic doom metal style. In its implementation, The Guessing Game comes off as Cathedral's attempt to do what Opeth did on the Deliverance and Damnation albums: show the extremes of their sound and what they sound like when either extreme takes prominence. Because it is done on one album, though, Cathedral is more successful in achieving the desired contrast. Not only does The Guessing Game give excellent insight into Cathedral's influences, it gives listeners greater appreciation for the band's older material. Being able to stand out from their peers is what gives this band an edge, and The Guessing Game widens the gap for Cathedral considerably.